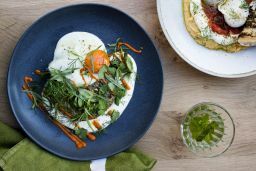 Following its opening this summer, ROVI, the new Fitzrovia restaurant from Ottolenghi, has launched breakfast. Head Chef Neil Campbell has created a menu, in collaboration with the wider Ottolenghi team, of breakfast dishes that are colourful, vegetable-focused and full of interesting flavour combinations. The new breakfast menu draws inspiration from a variety of different cuisines from across the globe. These dishes are punctuated here and there with Ottolenghi signatures – za’atar is used on a flatbread alongside warm butternut hummus, and the menu features a twist on a classic shakshuka, served with a duck egg and a combination of flavourful swiss chard, green harissa and spinach. The menu also offers non-alcoholic breakfast cocktails. Breakfast is served from 8.00am to 11.30am Monday to Friday, and 9.00am to 11.30am at the weekend.